Thousands of years of observation have shown that lunar rhythms affect us all, collectively and personally, instinctually and unconsciously. From the earliest simple etchings of moon phases on sticks, humanity has found ways to identify measure and predict the timing of events based on the cycles of the Sun, Moon, and Earth. Modern calendars, the tools we use for synchronizing our activities with the rest of the world, continue to be calculated using a soli-lunar formula. Although lunar phases are known to dictate the movement of tides; the growth of plants; and the breeding habits of domesticated animals, fish, and game; we have become so out of touch with nature that few of us even notice the moon unless it’s dramatically full. Much less are we able to recognize its cycle or phase by its appearance and location in the sky. This has been true in astrological circles, as well, where the moon’s cycle is generally considered too fast and thus too short term to offer meaningful information. However, as in other ancient traditions, the values of going back to basics and of working in balance with nature are experiencing a rebirth. 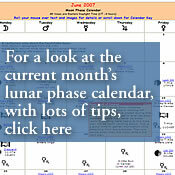 This can be seen in a renewed and growing interest in the monthly lunation cycle. And well it should be. These regularly repeated cycles describe the process of manifestation and can be applied to business endeavors, creative projects and personal growth with amazing results. Working with the eight phases as stages in a cycle encourages us to view life as a process by emphasizing continuity and evolution. Each new cycle offers us the opportunity to know ourselves a little better, to enhance our productivity, to become aware of our response patterns, to practice our spirituality and to live life more fully. Symbolically, the number 8 represents manifestation, form, and physical reality. A phase is a stage in the process of completion. The function of each stage in a cycle is to support the next stage, on through to the end, so that the cycle can begin again and continue moving forward. The first four phases make up the waxing or growing half of the cycle, when the energy is building. The last four phases make up the waning or ending half of the cycle, when the energy is released. The type of energy functioning in each of the phases alternates between active and receptive phases. The active phases are straightforward; choices are made and direction is initiated in the external world. These are the formative phases, which define the outcome of the cycle. The receptive phases are complex; information is gathered both from the consequences of previous activity and in anticipation of future activity. These are the mutable phases where changes occur internally and adjusting action is planned. The New phase is Active and Spontaneous. It is about self-discovery, beginnings, and intent. This phase involves the emotional body. Passion, desire, and excitement qualify the outcome of the cycle. At this stage, there is a minimum of awareness and knowledge. Innocence gives it a pioneering quality. The energy of this phase relates to sight, inner and outer. Since the whole picture cannot be seen, it is a time of vulnerability and doubt. A visionary action is necessary. The function of this phase is to become aware of the intention; later there will be opportunities to revise and reorient. During the New phase, we form our intent; we see it and act on it. The question is: What do I desire? It is important to picture the goal; make it emotionally satisfying. Create a visual representation of it that can be looked at throughout the cycle. The idea is to let the goal become clear without concern about how it will be accomplished. It’s time to trust in our selves, our ability to learn and adapt, and our potential to manifest. The Crescent phase is Receptive and Deliberating. It is about developing resources to protect and sustain the vision of the New. This phase pertains to the instinctive body. Intuition, reflex, and basic survival mechanisms preserve the imprint established during the New phase. At this stage, a commitment is made to be responsible for attaining the desired goal. The energy of this phase is stimulated by the senses of taste, smell, and touch. There is a struggle to gather adequate information to support the continued development of the cycle. Understanding the motivation behind the desire is vital to the function of planning for its fulfillment. During the Crescent phase, open yourself to information and plan for action. Ask: What need does my goal fulfill? How can I guarantee the survival of my vision? It’s time to let our instincts guide us. Nourish our selves with our favorite foods. Relax in a bath with essential oils. Allow our selves plenty of hugs. Review our resources and find the qualities that will help us to thrive. The First Quarter phase is Active and Impetuous. It is about breaking away and seeking individuality. This phase involves the feeling-moving body. The idea is to use body movement to generate energy that can then be channeled into creative expression. There is a sensitivity here that might be expressed in the extreme of wearing one's heart on one's sleeve. There is often a feeling of being misunderstood. It is important to move beyond the need for approval from others. The activity during this phase must clear away the obstacles so that the vision of the New phase will have space to develop and grow. The function of this phase is to create a secure foundation. During the First Quarter phase, we do what feels right. We need to act, to express our feelings and our independence. It’s time to put the past behind us. The question is: What can I do now to initiate the actualization of my vision for this cycle? It is important now to be on the move. Physical action is the key to this initiating energy. Stretch, dance or engage in exercise to alleviate a sense of being blocked. The Gibbous phase is Receptive and Discerning. It is about developing tools and techniques that serve the original vision. This is a pivotal point in the cycle. It connects directly to the New phase and once again relates to the emotional body. The first feedback is received regarding the goal of the current cycle. At this stage the information is analyzed for relevance. It is a time of questioning everything and seeking new methods that maximize efficiency. The energy of this phase relates to sight, inner and outer. Still the whole picture cannot be seen. There is a struggle to release judgment and learn self-trust. Confidence of inner vision awakens the power of creation. The function of this phase is to become self-reliant. During the Gibbous phase, we filter and analyze all of the information that we have obtained as a result of our previous actions. Ask: How can my plans be refined? What details have I overlooked? It’s time to review our original vision. Look at the picture we created in the New phase. Suspending criticism allows us to see it with clarity, reinforcing our intent. We learn to trust in the process. The Full phase is Active and Integrative. It is about awareness, co-operation, and sharing information. This phase involves the intellectual body where detachment supports objectivity. At this stage, illumination brings light to all the dark places; the shadows are exposed. The energy of this phase is stimulated by hearing, inner and outer. Action must be taken to establish relationship in order for balance to be achieved. The function of this phase is to begin the process of reshaping the goals in accordance with the awareness of the true meaning of the original vision. During the Full phase we must involve others in our activities. Equal relationships are the key to our awareness. We observe all that is reflected back to us. Ask: What can I do to bring harmony to the situation? It’s time to pay attention and listen closely to what is being said. When confusion distorts thought, remember that music calms the mind and song gives voice to spirit. The Disseminating phase is Receptive and Demonstrative. It is about communication, sharing resources, and being open to transformation. It connects to the First Quarter phase and also relates to the feeling-moving body. The power of what is felt to be significant is a propelling force for its distribution. At this stage, feelings need to be shared with others. The energy of this phase pertains to motion. An offering of belief is made. There is a struggle to align the personal vision with the needs of the whole. The function of this phase is to gain perspective. During the Disseminating phase, we share our vision with as many people as we can. The questions to be asked are: How do my goals contribute to the welfare of the collective? Has my idealism turned into self-righteousness? Review the feelings that prompted the action of the First Quarter. It’s time to allow our selves to teach what we’re learning. Exchange and move energy through group activity such as team sports or dancing. The Last Quarter phase is Active and Responsible. It is about reorientation, transition, and completion. It connects to the Crescent phase and also pertains to the instinctive body. Intuition and sensory responses to the environment direct the final action necessary to the fulfillment of the cycle's goals. At this stage, the action taken is either a correcting action or the final push needed to realize a successful outcome. The energy of this phase is stimulated by the senses of taste, smell, and touch. Action is essential and evident. The required action calls for a shift from the conservative to the inventive and there is some risk involved in changing the structure which has been built. The function of this phase is manifestation. During the Last Quarter phase, we are recognized for our accomplishments and must accept responsibility for our actions. We do what we have to do; we know instinctively the proper course. The question is: Where do I go from here? It’s time to use what we have accomplished to help others. Tactile, instinctive techniques to release blocked energy include bodywork, manipulation, and aromatherapy. The Balsamic phase is Receptive and Releasing. It is about letting go of the past and turning the thoughts and attention to the future. It connects to the Full phase and involves the intellectual body. As with Full, there is a detachment that serves to give an objective view. Whereas in the Full phase the awareness is of what is, in Balsamic the awareness is of what was and what is to be. The energy of this phase is stimulated by hearing, inner and outer. The inner voice whispers suggestions regarding the future. The struggle with surrender can produce confusion, which threatens to engulf and carry over into the next cycle. Liberation from the past must be attained in order to begin anew with consciousness and clarity. The function of this phase is to clear out the old patterns in preparation for a new cycle. During the Balsamic phase, withdrawal from the outer world is necessary. This is a time for dreaming, and quiet contemplation. Ask: What do I need to release? What do I choose to take with me into the next cycle? It’s time to be with ourselves, to listen to the voice within and to heal through meditational practices incorporating sound, such as chanting, drumming or toning. Observation of solar and lunar cycles is the basis of astrology. The study of these cycles and their phases provides us with a deeper level of understanding of all planetary aspects. Although most commonly associated with the lunation cycle, this eight-phase division is used in many spiritual teachings and can be applied to any of life's cycles. When working with planetary pairs, remember that the slower moving planet describes the theme of the cycle and the faster moving planet describes how the theme is carried out. The function of each cyclic process is suggested by the symbolism of the planets and/or luminaries involved. For example, the movement of Earth and its satellite, the Moon, around the Sun sets the rhythm and marks the steps in the dance of Life. Symbolically our spirituality (Sun) is manifested (Earth) via assistance from the soul (Moon). Each solar cycle is about the expression of our spiritual purpose. The Moon, in its cycle around the Earth, mirrors our daily experience of living and is about our response to collective needs. Our work with the lunation cycle is a continuation of the teachings of Robert 'Buz' Myers, who incorporated his “I AM” studies and components of Sun Bear’s Medicine Wheel into his monthly "On Time" moon phase workshops, which he first presented to the public in 1989 and continued monthly until his death in 2000. Sandra and David Mosley began their astrological studies in San Diego, CA, over 25 years ago. Their focus for the last 15 years has been the masterful application of the eight-phase lunar cycle as a pattern for living a fulfilling life. Based on the unique approach to cycles and phases of their late friend and mentor, Robert "Buz" Myers, the principles of the eight-phase lunar cycle of manifestation are easy to understand and can be applied to business endeavors, creative projects, and personal growth with amazing results. Sandra and David feel it is their mission to make their knowledge of metaphysics, astrology, the medicine wheel, and mandalas available to those who want to learn to use the lunar cycles to get in sync with their own natural and individual rhythms. The Mosleys make their home on the island paradise of windward Oahu where they encourage others to enjoy the value of natural timing and a purposeful life.